I'll be the first to admit it - I'm a fruit snob. I worked in a market for seven years, so I know what good fruit is supposed to look like. Working there ruined apples for me, or, better to say, refined my taste in apples. Growing up, we had three options. Red Delicious, Golden Delicious and Granny Smith - Granny Smiths are too tart for me, so I usually just stuck with Red Delicious. When I started at the market, I learned there were a lot of other apples out there. And I quickly picked a favorite - the Gala. They're great because the flavor is really good, but more importantly, the texture is nice - they don't get sandy and mealy like their counterparts. So, for the longest, that was my apple of choice. And then, I found out about Ambrosia apples. So huge, and sweet, with a nice tang to them- great texture. And on the heels of Ambrosias, Honeycrisps. They are the essence of what you want from an apple. The problem is, they are much, much more expensive than the old standbys. But, I don't buy a ton of fruit, so I'm going to buy what I want. Right? Right. So, I also love watermelon. In the summer, I like to get one of the nice, round, dark green ones from the Farmers Market. They're almost black and round like a cannon ball. I could eat myself sick. Which is a good thing, because Matt doesn't eat watermelon. He prefers canteloupe. I like honeydew. We manage to make it work. Pears? Love them, any way I can get them. Grapes - I like the purple, not the green. I don't know why. Kiwi, as long as someone else preps if for me. And that brings me to oranges. The gateway orange is a Navel - hard to go wrong. I discovered Cara Cara oranges about two years ago - their almost coral pink color is so pretty and they taste great. My mother has been telling me about these new oranges I have to try, and I was kind of ignoring her. Then I had one for the first time this weekend. Holy Citrus! 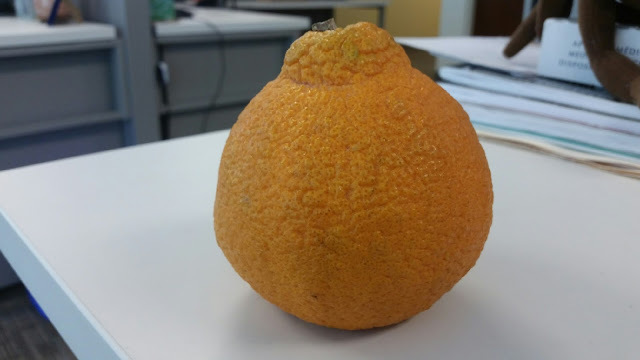 This is a Sumo - a seedless variety of Mandarin orange. It was first bred in Japan in 1972, and they brought it to California in 2011. The skin on it comes right off - no mess. And the taste is sweet and clean and citrusy. This one was about the size of a softball. And again, they are not cheap, but hey - I am totally worth it. The season is almost over, and I was late to the craze. So, I'll have to ride the Sumo wave as long as I can, then hope for strawberry and cherry seasons to hold me til we get to watermelon. This is what happens when you give up candy.